Life was good for my kind, beautiful mom Maggie in 2006. She celebrated her 25th Wedding Anniversary to the wonderful man she chose to grow old with, my step-dad, Raymond. They lived in Cumberland, Maine. Time was spent well with family, friends, the fairgrounds, horses, bluebirds, gardening, crafts, researching on the computer, traveling in their motor home, cooking…she had peace. They were snowbirds in the winter, escaping to Lakeland, Florida to enjoy family visits, friends, crafts, golfing, swimming, cooking…again she had peace. She earned every bit of the good life after conquering personal trials, a heart attack, cancer and un-diagnosed seizures. I’m the second child of four. My older sister Pam, younger sister Sue and baby boy of the family Dana, decided to surprise mom on her 70th birthday in 2008 and celebrate her on Campobello Island, Canada. Sue lived there at the time and it was a perfect spot to meet (Pam lived in AZ and Dana lived in CA). Mom loved the island’s peacefulness and serenity and she deserved every bit of it. She was a very giving person. 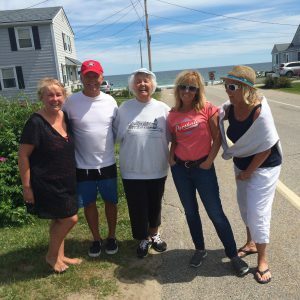 Her career in social work was dedicated to helping struggling women start a new life in Maine….but nothing brought her more joy then to see her children together. It’s hard to explain how good it felt deep inside to see her smile and laugh…all I ever wanted was for her to be happy. You are such a beautiful writer. I am proud of you for starting this website. I love what you have shared and can’t wait to read more. Love you! Your words mean the world….I find myself starting a new page and stopping….I know she would want this and your support helps more than you know….I love you. Oh sis’ I love you….thank you for your words and sharing… and I’m so sad about the unfair pain…..
.. please blog/add/invite to the journey when you are ready; I need you and I believe this will help us and all who have the same needs, wants and feeling of entrapment.